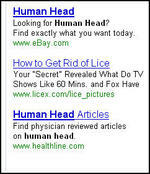 And Then I Googled "Decapitated Human Head"
I am so getting arrested. There's a God-awful smell of fecundity and rot permeating the basement, and it grows more noxious with each passing day. I called a plumber, and they graciously declined to come out and charge us for a visit, telling me that more often than not, these situations result from a decomposing dead animal stuck in the wall. I give you: "Dead Animals. Whatever you're looking for you can get it on eBay." 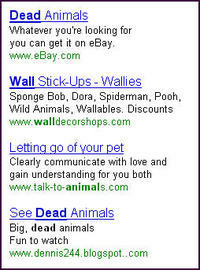 Has eBay purchased every possible search phrase on Google? I wanted to Google "Decapitated Human Head," to see if an eBay ad promising to fulfill my e-commerce dreams would pop up, but I'm trying to avoid a visit from the Department of Homeland Security. And I have no comment regarding the "See Dead Animals" link, which I did NOT click on. "See Dead Animals. Big, dead animals. Fun to watch." Note the use of boldface type, judiciously reserved for the word "dead." Oops; I just commented. 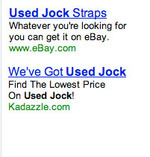 See other Google goodness, including When Contextual Ads Go Horribly Awry, Part 1. The Bush Administration is attempting to get Google to turn over 5 gazillion hizobtytes of data regarding searches conducted by its users. The Administration says they need the data to catch "the evildoers, like those who attacked us on 9/11." With over 5 gadabillion searches a day, Google is the most popular search engine, and news of this request has privacy advocates deeply concerned. President Bush rebuffed those concerns. "We got ahold of Yahoo's records, and looky here," said President Bush. "This person, Paul Santos - is that an Arabic name? - searched for 'Golden Globes Scarlett Johansson's breasts.' You can't tell me he's not up to no good." "remove chocolate pudding from stuffed animal fur"
"degree programs for circus clowns"
I hope this helps the cause of freedom! A couple of weeks ago, I wrote about an overheard conversation on the T, which covered, among other topics, keratoid cysts. Adam Gaffin was kind enough to inform me that such a cyst is also known as a teratoma, after which I found myself going down the path of no return with Google and Google images. 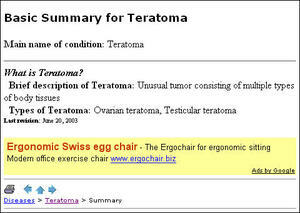 Google has determined, by way of a sophisticated algorithm, that if you are looking up that pesky ovarian cyst of yours comprised of hair and teeth, then surely you will be interested in buying an Ergonomic Swiss egg chair from www.ergochair.biz. Google Unveils "Google No E"
Google announced today that is unveiling "Google No E" as a replacement for the company's Google Print program, which had been met with much resistance from publishers. 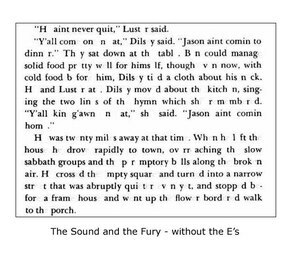 With Google No E, Google will scan and make available every book ever published, with all instances of the letter E omitted. "We had some negative reactions from publishers to our GooglePrint program," said spokeswoman Donna Manfreid. "So we decided to get past those pesky copyright issues by allowing users to search the full-text of every book ever published and view actual, scanned pages, but without the E's. We think this will go a long way toward our mission while ameliorating the concerns of publishers." When asked to comment, president of the American Association of Publishers Pat Schroeder said, "It's a step in the right direction, but we're going to monitor the situation closely to make sure no errant E's slip through. If Google makes any excerpts available with the E's included, then book sales will plummet and we'll have to call our lawyers."